1. Persian king, identical with Xerxes (486-465 B.C.). The Book of Esther deals only with one period of his reign. It tells us that he ruled over one hundred and twenty-seven provinces—"from India, even unto Ethiopia" (Esth. i. 1). In the third year of his reign he made a feast to show his riches and splendor; "the power of Persia and Media, the nobles and princes of the provinces, being before him" (ibid. i. 3). After this feast, which lasted one hundred and eighty days, he made another of seven days, to which "all the people . . . great and small" were invited. At the same time Vashti the queen gave a banquet to the women (i. 9). On the seventh day (i. 10) Ahasuerus summoned the queen to appear before him, and the banqueters, too, so that all might see her beauty. This Vashti naturally refused to do (i. 12); but the king, angered at her disobedience, took the advice of his counselors and set the queen aside. At the same time he sent proclamations throughout the land, declaring the husband the ruler in every household (i. 22). Between the events of the first chapter and those of the second some years may be supposed to intervene, during which Ahasuerus is busy with his attempt at enslaving Greece. He fails, and returns to Persia. On his return a second consort is found for him, and in the tenth month of the seventh year of his reign (ii. 16) Esther becomes queen. The Biblical account then introduces what must have been a very common episode in the life of Persian monarchs. Two eunuchs, Bigthan and Teresh (Persian, Bagatana and Tiris; Jules Oppert, "Commentaire Historique et Philologique du Livre d'Esther," p. 22), form a conspiracy against Ahasuerus, which might have succeeded, had not Mordecai (through a Jewish slave of one of the conspirators, suggests Josephus, "Ant." xi. 6, § 4; but through Mordecai's knowledge of seventy languages, suggests the Targum) discovered it to Esther, who in turn told Ahasuerus. The conspirators are hanged, and the account of the conspiracy and its discovery entered in the chronicles. Later on the king rewards Mordecai for his fidelity (Esth. vi. 2-12). Haman now comes to the front as the chief adviser of Ahasuerus (iii. 1). Mordecai will not do reverence to Haman, who thereupon, scorning to lay hands on Mordecai alone, plots to destroy all the Jews throughout the kingdom. The king gives his consent (iii. 11), but withdraws it on the intercession of Esther, puts Haman to death, and raises Mordecai to the position that Haman held. Fresh proclamations are sent out ordering the Jews to defend themselves and to take vengeance on their enemies (viii. 13). No further information about Ahasuerus is given in the Bible. Only once more is he mentioned—in Ezra, iv. 6. See Esther, Haman, Mordecai, Purim. Alabaster Vase with Name of Xerxes in Persian, Susian, Assyrian Cuneiform and Egyptian Hieroglyphics. 2. Father of Darius the Mede (Dan. ix. 1). Ahasuerus, the Persian king of the Book of Esther, being identified by the rabbis with the one mentioned in Dan. ix. 1 as father of Darius, king of Media, and with the one mentioned in Ezra, iv. 6, is counted as one of the three kings of Biblical history who ruled over the entire globe, the other two being Ahab and Nebuchadnezzar (Meg. 11a; Targ. Sheni on Esth. i. 2 has four, counting also Solomon among them; see Meg. 11b). He was wicked from the beginning to the end of his reign. Upon the slanderous report of the Samaritans he stopped the work, begun under Cyrus, of the rebuilding of the Temple (Ezra, iv. 6; Esther R. intro.). Whether he was a wise ruler or a foolish one is a matter of dispute between Rab and Samuel (Meg. 12a). According to R. Gamaliel II., he was simply whimsical and vacillating (ib. 12b); according to another tradition which was handed down by Abba Gorion, he was so unstable that he sacrificed his wife to his friend, and his friend to his wife (Mid. Abba Gorion i. 1), probably meaning the emperor Domitian, of whom this statement was true (compare Bacher, "Ag. Tan." i. 96 et seq.). In his ambition Ahasuerus wanted to sit on King Solomon's wonderful throne, described in the Midrash and the Targum to Esther, but he could not. His "showing the riches of his glorious kingdom" to his princes (Esth. i. 4) was especially sinful, as he had all the sacred vessels from the sanctuary taken out of his royal treasure-house to the banquet in order to boast of these possessions, thus committing an offense against God and the Jews. He heaped up great treasures and in his miserliness hid them. Cyrus, his successor, found them, and offered them to the Jews in order that they might rebuild the Temple therewith. These are "the treasures of darkness" promised to Cyrus in Isa. xlv. 3 (Esther R. i. 4). The restlessness of Ahasuerus on that night which decided the fate of the Jews was caused by the archangel Michael (Gabriel), who knocked him to the ground 366 times, and then brought before him a company of butchers, bakers, and butlers, to whom the king in his anger said: "You have poisoned me!" They replied: "See whether Esther and Haman, who ate and drank with you, are poisoned." When Ahasuerus found that they were well he sent for the book of the chronicles, and there learned of Mordecai's unrewarded act (Midr. Abba Gorion). PirḲe Rabbi Eliezer, xi., in accordance with Targ. Sheni on Esther, at the beginning, counts ten kings as rulers over the entire globe: God, Nimrod, Joseph, Solomon, Ahab, Ahasuerus, Nebuchadnezzar, and Alexander the Great; then, as the ninth, the Messiah; and last, God Himself again. It is also said there that Ahasuerus was the wealthiest of all the kings of Persia and Media; that he is mentioned in Daniel (xi. 2), where it is said: "The fourth shall be far richer than they all"; and also that he set up couches of gold and silver in the thoroughfare of his capital to show all the world his riches; all the dishes and vessels he used were of gold, while the pavement of his palace was entirely of precious stones and pearls. Despite the fact that both Josephus ("Ant." xi. 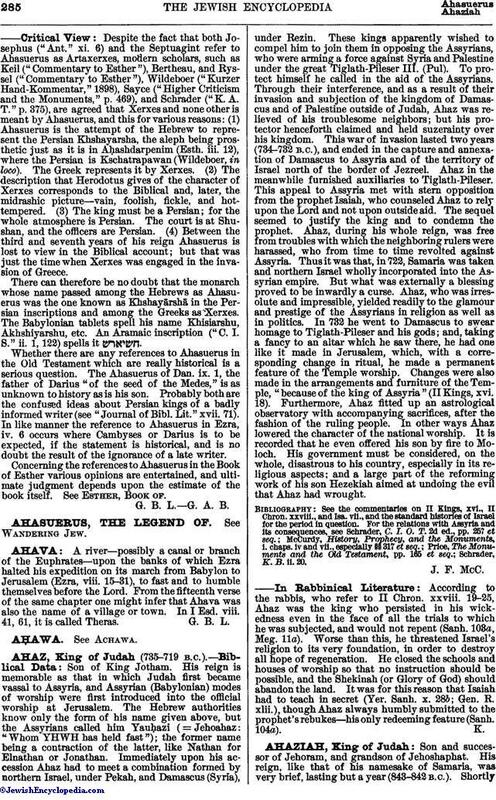 6) and the Septuagint refer to Ahasuerus as Artaxerxes, modern scholars, such as Keil ("Commentary to Esther"), Bertheau, and Ryssel ("Commentary to Esther"), Wildeboer ("Kurzer Hand-Kommentar," 1898), Sayce ("Higher Criticism and the Monuments," p. 469), and Schrader ("K. A. T." p. 375), are agreed that Xerxes and none other is meant by Ahasuerus, and this for various reasons: (1) Ahasuerus is the attempt of the Hebrew to represent the Persian Khshayarsha, the aleph being prosthetic just as it is in Aḥashdarpenim (Esth. iii. 12), where the Persian is Kschatrapawan (Wildeboer, in loco). The Greek represents it by Xerxes. 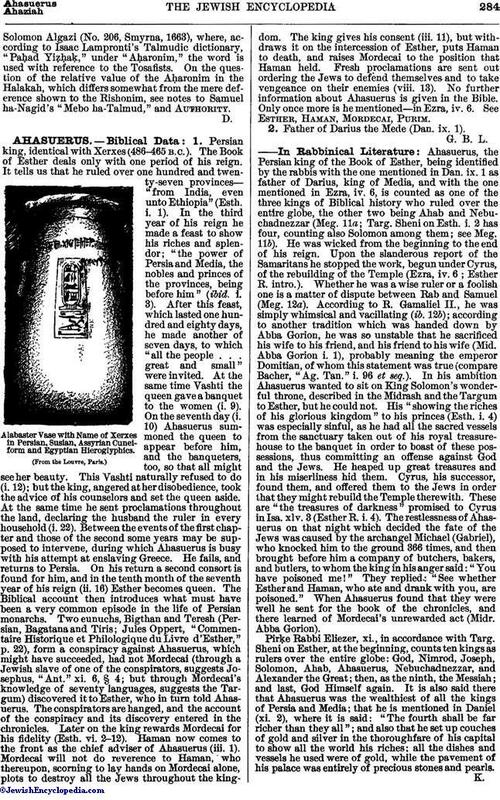 (2) The description that Herodotus gives of the character of Xerxes corresponds to the Biblical and, later, the midrashic picture—vain, foolish, fickle, and hot-tempered. (3) The king must be a Persian; for the whole atmosphere is Persian. The court is at Shushan, and the officers are Persian. (4) Between the third and seventh years of his reign Ahasuerus is lost to view in the Biblical account; but that was just the time when Xerxes was engaged in the invasion of Greece. There can therefore be no doubt that the monarch whose name passed among the Hebrews as Ahasuerus was the one known as Khshayārshā in the Persian inscriptions and among the Greeks as Xerxes. The Babylonian tablets spell his name Khisiarshu, Akhshiyarshu, etc. An Aramaic inscription ("C. I. S." ii. 1, 122) spells it . Whether there are any references to Ahasuerus in the Old Testament which are really historical is a serious question. The Ahasuerus of Dan. ix. 1, the father of Darius "of the seed of the Medes," is as unknown to history as is his son. Probably both are the confused ideas about Persian kings of a badly informed writer (see "Journal of Bibl. Lit." xvii. 71). In like manner the reference to Ahasuerus in Ezra, iv. 6 occurs where Cambyses or Darius is to be expected, if the statement is historical, and is no doubt the result of the ignorance of a late writer. Concerning the references to Ahasuerus in the Book of Esther various opinions are entertained, and ultimate judgment depends upon the estimate of the book itself. See Esther, Book of. G. B. L.G. A. B.